The Model P-18 is one of our biggest humidors and will easily hold your largest cigars. If you are a Churchill fan, this is the humidor for you. It holds 18 cigars up to 8 1/4" long in 3 trays. The model P-18 comes with the Boveda 2-way humidification system. This Limited Edition Camo version features the "Real Tree" Camo finish. 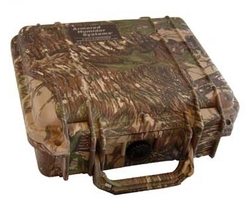 Just of few of these Limited Edition Camo travel humidors remain!